Synopsis: Patients from all over the world seek out the brilliant Dr. Edelmann (Onslow Stevens), a physician with a keen mind and a big heart. He has a practice that he runs out of his castle in Vasaria, and those who have lost hope in conventional medicine can turn to him in their hour of need. Late one night Edelmann is dozing in an easy chair when a man in top hat and tails shows up in his living room and wakes him. The stranger introduces himself as Baron Latos, but it’s obvious right away that he’s really Count Dracula (John Carradine). He wants Dr. Edelmann to help find a cure for his vampirism. By cure, Dracula presumably isn’t looking for the sunlight-and-wooden-stake cure. We’re talking a medical cure, something that will make him mortal again. Since Dracula’s already dead, I would rate his chances for a full recovery as vanishingly slim, but Edelmann is made of sterner stuff and agrees to give it a try. Meanwhile, an agitated man is trying to get in to see Dr. Edelmann. It’s our old friend Lawrence Talbot (Lon Chaney, Jr). and after badgering the receptionist for a while, he rushes out of the clinic, jabbering about the full Moon that will soon rise. In his laboratory, Edelmann is examining the Count’s blood cells under a microscope, when he gets a phone call from Vasaria’s chief of police (Lionel Atwill). A distraught man has demanded to be incarcerated. He’s clearly a nutter, so would Edelmann come down and have a look at him? Edelmann does so, and comes face to face with Lawrence Talbot, who claims he turns into a werewolf when the Moon is full. At just about that moment, the full Moon comes into view and Talbot changes into a wolf man — before his very eyes. He tells the Chief to keep the beast imprisoned until morning — then he will examine Talbot. When Dracula comes back Edelmann tells him that vampirism is caused by a blood parasite, and that a series of blood transfusions might do the trick. It turns out that Talbot’s problem also has a scientific basis. Talbot turns into a werewolf, we are told, because he believes he will. This belief, combined with certain irregularities in Talbot’s skull that put pressure on key points in the brain, trigger his lycanthropic proclivities. The condition can be cured, Edelmann says, but it will take time. This is too much for the excitable Talbot, who races out of the castle and throws himself off a nearby cliff into the ocean. Edelmann, believing Talbot may have been swept into a cave in the cliffside, lowers himself with a rope down the cliff face. He finds that Talbot — now a wolf man — has indeed found his way into a cave. Moreover, there’s someone else there — Frankenstein’s monster, in suspended animation…. Comments: Bram Stoker brought vampire lore to the public imagination with his 1897 novel Dracula, but it was Tod Browning’s 1931 film version that fixed it there permanently. The inevitable Dracula sequels wore out their welcome rather quickly, and by the mid 1940s the most obvious variations on the story had been played out. Ostensibly a sequel to House of Frankenstein, House of Dracula is another monster rally, but one with a built-in twist: both vampirism and lycanthropy are suddenly revealed to be medical conditions, which can be cured with the proper application of scientific know-how. Of course, what we’ve already learned about these creatures makes such explanations hard to swallow. A parasitic infection that allows its victims to turn into bats, hypnotize people from across the room and live for hundreds of years? That’s some parasite! How about a defect in brain development that causes people to turn into snarling wolves? Really? But it doesn’t pay to think about it too much. 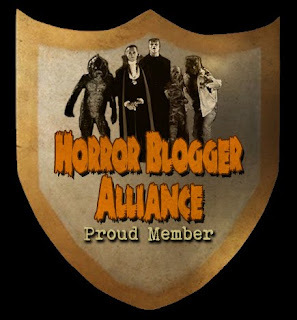 House of Dracula is going there, and you might as well just shrug and follow along. And once you do, it works fairly well, largely on the strength of Onslow Stevens’ performance as Dr. Edelmann, a sort of Transylvanian Albert Schweitzer. Or Dr. House of Dracula, if you will. Lon Chaney, Jr. runs around hysterically during his bit of the movie, wearing the mustache he apparently grew for the Inner Sanctum mysteries. He’s even less inspired here than he was in the previous Wolf Man outings, and that’s saying something. 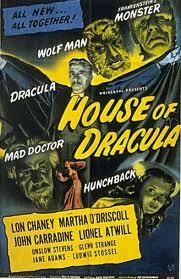 Why did Universal opt to go back to John Carradine after his dismal performance as Dracula in House of Frankenstein? He certainly doesn’t improve here, and he’s dressed up like a magician at a kid’s birthday party for most of the film. 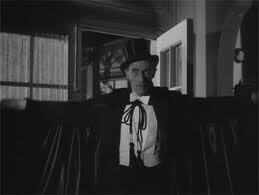 My dear Count — top hat, tails and a cape for a visit to the doctor’s office? Really? Even if it’s after six pm (and for Dracula, it always is) this is a sartorial no-no. Martha O’Driscoll does well as Milliza, who winds up in a nutty love triangle with Dracula and the Wolf Man. And Jane Adams is particularly compelling as Nina, devoted assistant to Dr. Edelmann, as well as the sexiest hunchback in the world. A hunchback has apparently become a requirement for these movies, so Nina’s doing double duty here. I hope it added something to her paycheck. Same writer, director, producer, and same actors playing the three monsters as in HOUSE OF FRANKENSTEIN. Diminished results too, although Carradine's Dracula gets down to something truly evil by infecting the doctor's blood with his own (blurring the poor hunchback's vision during the process). Fortunately, the vampire is only pretending to seek a cure because he's interested in the blonde nurse, having met her before, so he's definitely more in character than in HOF (Carradine's next outing in the role would be BILLY THE KID VERSUS DRACULA). Chaney was THE horror star at Universal during the war years, but this was the end of the line, and he knew it. 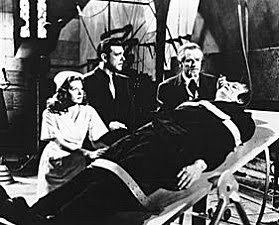 Glenn Strange's Monster, again criminally wasted until the two minute finale, doesn't even get to perish his own death, since the filmmakers used climactic footage shot for THE GHOST OF FRANKENSTEIN (essentially Chaney destroying Chaney!) Onslow Stevens has been roasted for his scenery chewing, but I rather enjoyed it, since there are no monsters left to compete. Despite the impoverished circumstances, probably a tad better than HOUSE OF FRANKENSTEIN.